Amanda Barrett has been practicing law since 2008. Amanda grew up in LaFayette, Georgia and LaGrange, Georgia. While her practice is devoted primarily to consumer bankruptcy, she also has experience in municipal law, corporate finance, wills, personal injury, workers compensation and family law. After receiving a B.S. in Accountancy, with high honors, from LaGrange College in 2005, she received her Juris Doctor, with high honors, from the University of Georgia School of Law in 2008, where she served as a notes editor on the Law Review and received the Julian McDonnell Award for Excellence in the Study of Commercial Law. Mrs. Barrett was selected to the prestigious and exclusive Order of the Coif in 2009. Prior to joining Harmon & Gorove, Mrs. Barrett was an associate at one of the world’s largest law firms, DLA Piper, where she focused on commercial banking, lending and foreclosures. Mrs. Barrett has utilized her vast knowledge of financial law and tax regulations to assist in her practice of consumer bankruptcy. Using the fine nuances of the law, she assists her clients in obtaining the best possible outcome in their case as she has in well over 1,000 cases. Mrs. Barrett is active in the community. 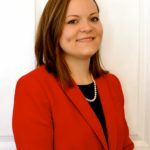 She is a graduate of the Newnan Citizens Academy, a volunteer with Keep Newnan Beautiful and is currently serving as a member of the Newnan Cultural Arts Commission. She is a past president and sustaining member of the Newnan Junior Service League and is an active member of the Central Baptist Church. Mrs. Barrett is married to Daniel, an educator with the Coweta County School System and is the proud mother of two little girls. Mrs. Barrett and her family reside in Newnan.